LONDON —The Earth's moon may be a present from Venus, which once had a moon and then lost it, a new theory suggests. Under the theory, Earth's gravity captured Venus' old moon, giving our planet its big natural satellite. This idea contrasts to the thinking of the vast majority of moon researchers, who believe that the Earth's moon formed some 4.5 billion years ago when a planet-size body slammed into nascent Earth at high speed. "I think part of the key to [understanding] the moon may be that Venus has no moon, and we certainly have to study it (Venus) more," said Dave Stevenson, professor of planetary science at the California Institute of Technology, who proposed the Venus idea at the conference. In an interview with SPACE.com after his presentation, Stevenson said that he himself favored the impact theory on moon formation, but unfortunately this theory did not yet answer all the questions. How did Earth get its moon? However, the geochemical composition of the moon and Earth likely trips up this theory. Analyses of the lunar rocks brought back by NASA's Apollo moon landing missions have shown that the satellite has an isotopic composition very similar to that of Earth. Isotopes refer to varieties of chemical elements that have the same number of protons, but different numbers of neutrons. Two isotopes behave the same chemically. And if both moon and Earth have very similar isotopes, it makes the capture theory difficult to maintain, said Alex Halliday, head of science at Oxford University. Such isotopic similarities suggest that "the material that makes up the moon did actually either come out of the Earth, or that the stuff that was in the disk that formed the moon got completely mixed up with the stuff in the Earth." Nonetheless, some aspects of the idea that the moon may have come from Venus are intriguing, he said. "The reason why it's interesting is that Earth and Venus are close to each other. They have similar mass, and people think they have probably formed in a similar way," he said. "So the question is, if Earth and Venus formed in similar ways, how come the Earth has a moon and Venus doesn't?" Stevenson's idea would answer that question, Halliday said, "throwing a new twist into the whole capture theory." 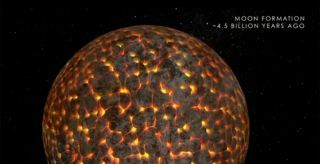 There are many theories for what might have caused such a large moon for a planet as small as Earth. The most popular theory assumes an impact, where the debris of the collision — a mix of the material from Earth and the other body — gave birth to the moon. This body then stayed in orbit about the Earth, forever bound to its new home. Another posits that the moon "fissioned" from the Earth's crust and mantle due to the centrifugal force of a rapidly spinning early Earth. Another theory, called binary accretion, assumes that the moon was born at the same time and place as Earth. The biggest flaw of the fission, capture and binary accretion theories is that they cannot account for the high angular momentum of the Earth-moon system. Scientists believe that initially the Earth was spinning so rapidly that a day lasted only five or six hours, and the moon was in a very low-altitude orbit. But gradually, tidal drag slowed the Earth's spin and pushed the moon's orbit up to its present level. The capture theory will always face a challenge explaining the similar composition of the moon and Earth, Stevenson said. But if scientists analyze rocks from Venus and they turn out to be very similar to those on Earth, that would argue in favor of the capture theory. The giant impact idea also has trouble explaining why the Earth and the moon are so peculiarly similar. Even though he himself favors the impact theory, Stevenson said he picked Venus for a larger purpose. "We cannot understand the terrestrial planets unless we understand Venus, and at the moment, we don't know anything about Venus in terms of the isotopes" it has, he says. "And I also think that as a test of our understanding of the origin of the moon, we need to understand whether Venus ever had a moon." If Venus indeed once had a moon and lost it, how might the planet have acquired a satellite in the first place? Unlike what would have happened with Earth, the formation of any moon of Venus may have occurred much earlier, shortly after the formation of the solar system, Stevenson said. Back then, there were still a lot of things whizzing around," he said. So Venus possibly would have gotten its moon after an even earlier giant impact of some sort, and the planet may have lost its moon either by collision or by escape. This would mean an object passed close by the Venus system and caused the moon to depart from its orbit, says Stevenson. But even aside from the Venus idea, the widely preferred giant impact theory still "is not satisfactory in all respects," Stevenson said. Sean Solomon, the director of the Lamont-Doherty Earth Observatory of Columbia University, agrees. "We are still on the trail of the detailed scenario that would seem both likely and complete in its ability to account for all the geochemical and geophysical observations," he said. Until scientists have figured out that scenario, even the escaped moon of Venus is a plausible theory, he said. "Even with the giant impact idea, we don't know the origin of the impacting object. It could've been an early protoplanet. It could've been a moon of another object that was removed from the gravitational field of its original [planet]. It could've been a very large asteroid. All of those scenarios are still open."